Planning a romantic adventure can be a really fun and exciting way to please your partner. 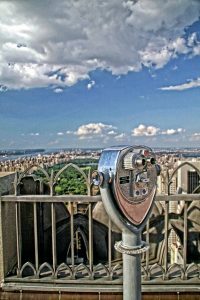 If you live on Long Island, or are planning a trip, have you ever considered taking a tour of New York City? A great idea to do this is to visit some romantic settings in a romantic vehicle with a car service. Why not rent one of our sleek black limousines for a tour of the greatest, and most romantic city in the world? We have provided a list of the ten most romantic places to take your love in one of our luxury cars. From Carriage Rides in Central Park and boat rides below Bow Bridge, to Belvedere Castle and the Conservatory Garden, Central Park may just be New York City’s most romantic place. Central Park is a magical place in New York City in every season, whether it’s winter, spring, summer or fall. The magical setting will only be accentuated when you arrive via a black stretch limousine provided by a car service. If you’re looking for an amazing view that’s sure to impress, then have one of our limos drop you and your love off at the entrance of the Empire State Building. You and your partner can then visit the top of the building, which has played setting to millions of romantic moments. From the building’s observation deck you see as far as 80 miles during the day. However, nighttime offers the opportunity to gaze at the glowing city below. Consider visiting in the late afternoon to get the best of both worlds. If you are wooing a lovely young woman, nothing will impress her more than escorting her in a limousine to the most luxurious jewelry shop in the world. If you are thinking of popping the question, getting down on one knee in front of our limo along with a ring from Tiffany’s will guarantee a yes to the big question. In spring or summer, nothing will be more romantic than a top down car tour of Manhattan and then crossing the bridge into Brooklyn. While driving through the scenic neighborhood of New York’s famous burrough, remember that there is nowhere more romantic than the Brooklyn Botanical Gardens. Brooklyn Botanical Gardens’ indoor environments offer visitors a pleasant respite even when the weather isn’t on your side. New York City always looks more beautiful from a distance, but you don’t have to go very far to get that perspective, especially when you are taken around by one of our chauffeurs. The Brooklyn Promenade offers visitors a spectacular view of lower Manhattan, as well as delicious nearby options for lunch, dinner, and dessert. Have your driver drop you at the heart of the city at 30 Rockefeller Center to check out the ice skating rink! 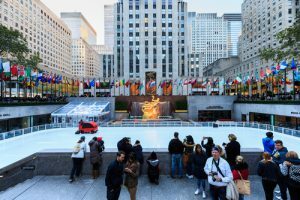 The Rock Center Ice Rink will be less crowded once the holiday season has passed, but that won’t diminish the romance of spending an hour or two twirling on the ice. And even if you can’t skate gracefully, it gives you an excuse to hold hands so you don’t fall down. Sometimes romance comes in learning and exploring a beautiful museum. After your tour of Central Park, have your limousine stop at the Metropolitan Museum of Art! 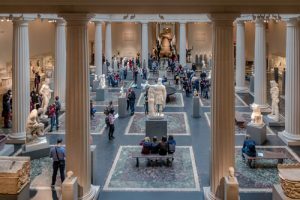 From artifacts of Ancient Rome to the museum’s collection of modern art, the Metropolitan Museum of Art offers you an opportunity to show off your more cultured side. If you need an escape from all the art, the Met also features some great options for drinks and dining right in the heart of the museum. When you’re trip is over give an airport service a call to get to your flight home on time. If you would like a quiet escape from the city, have your chauffeur drop you and your partner off at the scenic Hudson River Park. Spanning 5 miles from Battery Park to West 59th Street, the Hudson River Park offers an escape from the buzzing metropolis of New York City, as well as fantastic views of the Hudson River and New Jersey. If you are looking for a scenic voyage around the city, tell your driver that you would like your limo to get to New York City’s Waterways downtown. From scenic cruises to kayaking, New York City offers a vast array of ways to take advantage of the waterfront of Manhattan. A particularly popular “cheap date” is to take the Staten Island Ferry from Battery Park City, which offers a great view of the harbor and the Statue of Liberty. The Revson Fountain in Lincoln Center is one of New York’s most romantic spots, especially in the evening. 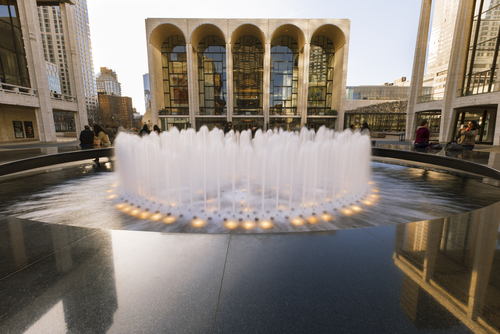 Even if you can’t serenade your sweetie from Avery Fisher Hall, you can show off your savvy by taking a stroll by the Lincoln Center Fountain. Imagine escorting your love out of your limo and then walking her towards the fountain for a lovely and romantic moment. Whether it’s a romantic tour of New York City, or a ride to a big event, our airport car service has a myriad of options for you. Contact us today to hear all about our limousine and town car packages!